How to use Webcam Morpher in Digsby? How to use Webcam Morpher in Camfrog? The biggest advantage of WebCam Morpher (WCM) Pro version is that it works with any nickfaces while the free version recognizes only two nickfaces at a time. This feature makes WCM Pro version the most appropriate tool for humorous users who want to play different roles for funny video chat. From our nickface download page users can freely download several nickfaces. In this tutorial, we demonstrate how to use Webcam Morpher 2.0 with Camfrog 5.0, one of the most popular live webcam chat community. » See the video tutorial: How to use Webcam Morpher in Camfrog? - Run Camfrog 5.0, log in your account . - Click Actions » Settings… (Ctrl+ S) to open the Camfrog Settings dialog box. 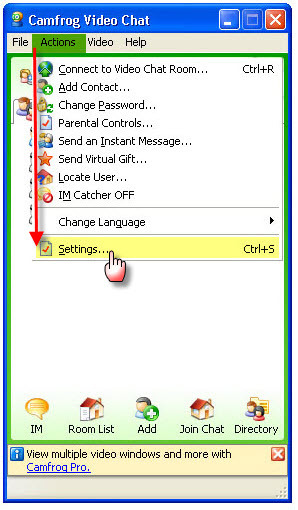 Fig 1 - Open Camfrog Settings dialog box. - In the Camfrog Settings dialog box, choose Video (1). - In the Devices area, choose AV WebCam Capture for your video capture device (2). From now on, AV WebCam Capture will be the active video device used by Camfrog. Start Webcam Morpher, and choose the nickface from the Nickfaces list. Note: From our nickface download page users can freely download several nickfaces. - In Camfrog choose CamfrogWorld then click Yes. - And now , your webcam had been show into CamfrogWorld .